We always go and get our Christmas on the Friday after Thanksgiving and this year was no exception. We headed out to Cobb Christmas Tree Farm to pick the perfect tree. It feels so nice to go to the same place every year to pick out the tree, because you start to feel like family when you are recognized the minute you walk in. The Cobbs always have hot chocolate and cookies along with a fire (yesterday it was 70 degrees so they didn't have the fire) to make getting a Christmas Tree a really fun experience. They also have a life size horse statue that the kids (some not so little) can get on and have their pictures made. However, it didn't take very long at all to find the perfect tree, so we tied it to the top of the car and brought it home. After we got the tree in the house, we went to the movies to see Love The Coopers, and I highly recommend it. We cried a little and laughed a little which to me makes the perfect movie. We are starting the Christmas season off on a very festive note! Tomorrow afternoon we'll get the lights on the tree and Sunday we'll decorate. We always have a family tree decorating party complete with a cheese board, smoked salmon and some sweet holiday treats. It's also the day when the Christmas music begins in the Smith home! Any opportunity for a cheesy picture! Our tree was grown in the mountains of North Carolina. It is very fresh and will stay green until the new year! Two beautiful girls standing beside our perfect Christmas Tree! The Cobbs make sure that there are lots of opportunities for family pictures. This is the life size horse! They also have a barrel of hats to use as props! Inside the barn, the Cobbs have hot chocolate, cookies, and hot dogs! They really want you to stay a while! This is the pot belly stove, unfortunately yesterday was way too warm for a fire! I'm ready for a little chilly weather so it feels like Christmas. These guys greet you as you drive up the driveway! Mr. Crazy Blonde putting the tree on top of the car! What would we do without him! Finally home, it's kind of a process. Taking the tree into the house! It's so exciting to start decorating for Christmas! Again, I'm helping sort of! So, next week, I'll show you the finished tree! I have new ribbon coming and I can't wait to get the lights and ornaments on. For now, I'm just glad we got it in the house! 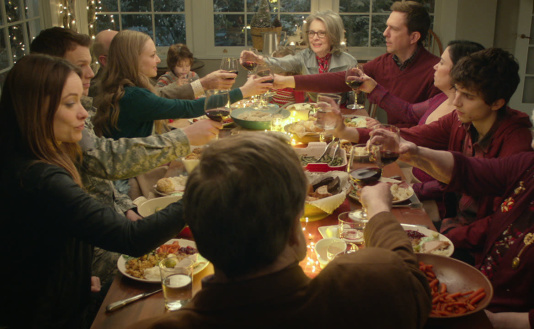 I've included the trailer for Love The Coopers! Just click on the link. I hope you enjoy!